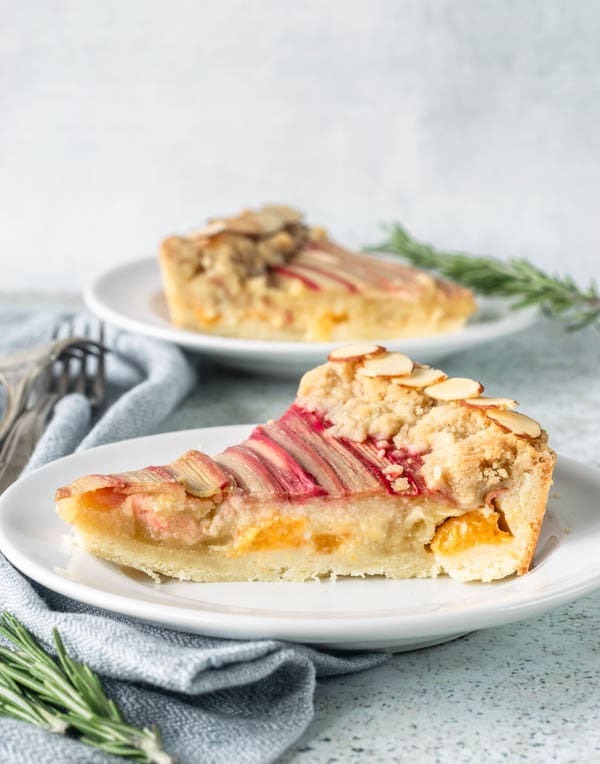 Apricot Rhubarb Almond Tart on the menu today! If you know a thing or two about me, you know my dream is to have a bakery/cafe type of thing. 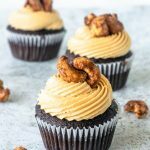 I just want to have a place where I can bake different cakes and treats every day. In my dreams, I see a big counter, full of pastries and pies! And in these visions I have, I see this tart! 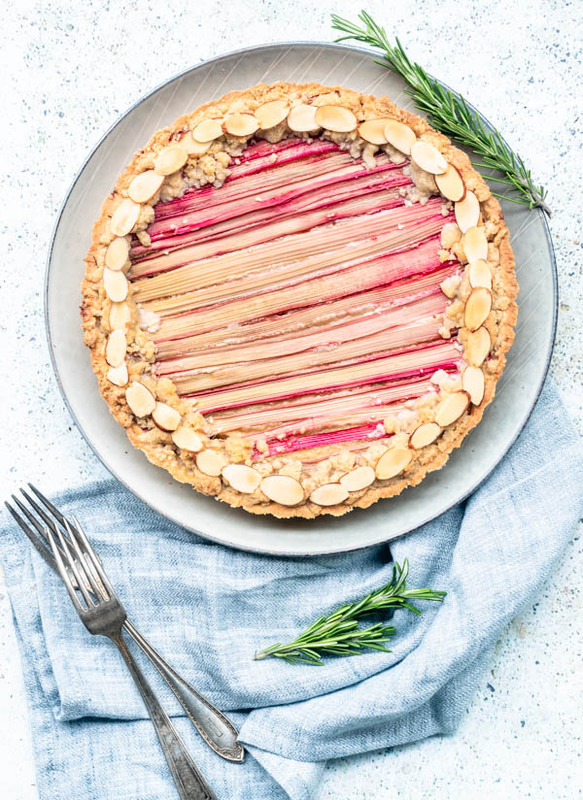 It’s an Apricot Rhubarb Almond Tart. 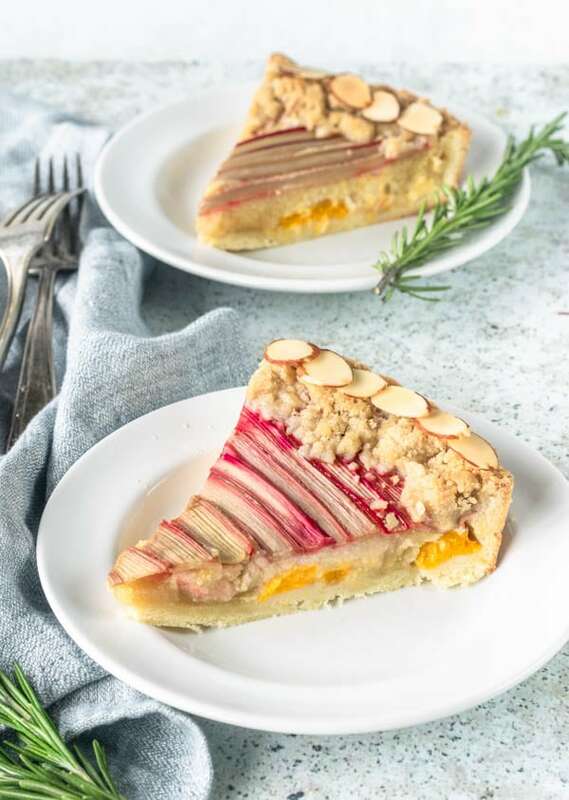 Almond cookie-like crust, sliced and layered apricots on the bottom, topped with a insanely delicious almond cream, covered in rhubarb ribbons and a crumble topping! I bake a lot, as you can tell from this website, and this is probably one of the most delicious things I’ve ever baked! The flavors here have got me HOOKED on this tart! About my bakery. I see this tart in a beautiful display, on top of a cake stand, taking the prime spot! What a show off! Now, it might take me a few years (or decades) to get my bakery. But I am willing to wait. I am willing to work hard so one day I will be able to actually physically stare at the display of treats I see in my head, in my dreams. And, you know what? I am not even upset about waiting. It’s not like I’m sitting around waiting for some opportunity to fall on my lap. I am giving my whole soul to this baking thing! I put everything I have into my dreams! And, after all, it’s not about the destination, anyway… it’s all about the JOURNEY! And I am having a hell of a time on my journey! I look forward to waking up everyday because I have so much I want to accomplish! Yesterday, my husband Brian said to me that the lottery was $300 million or something. “What do you think we would be doing if we won that money?”, he asked me. Yes, Brian, we can move to Hawaii, I don’t know about the yacht though. That’s when I realize how happy I am. I couldn’t care less about money. My whole heart is in this thing right here. Would it be nice to have a lot of money? Of course, I’d buy a better camera, have a bigger studio, not have to work for someone else. Money would give me freedom and resources. But no amount of money would ever change my passion and my drive. Freedom and resources, or lack of them, are no excuse for me. I am the one who makes the resources, I am the one who makes the time, and I am the one who makes myself free and available to work on my passion. Nothing that is great can be built without a tone of work. And I am ready, bring it on! 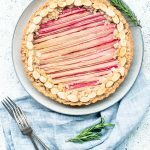 Apricot Rhubarb Almond Tart is a delicious dessert with an almond crust, layered apricots on the bottom, topped with an almond cream, covered in rhubarb ribbons and crumble topping. 1 cup almond flour about 4 oz. In the bowl of an electric mixer, cream butter for about 1 minute. Add powdered sugar and cream for another 2 minutes at medium speed. Add almond flour and salt. Mix to combine. Add vanilla extract and egg. Mix on medium speed for 30 seconds to incorporate egg. Scrape bowl and make sure egg has been fully incorporated. Add all-purpose flour and mix on low briefly or with a spoon to combine ingredients. Mix just until flour has been fully incorporated. Wrap dough in plastic wrap and press it lightly into a small disk. Leave it in the refrigerator for about 2 hours. Cream butter in the bowl of an electric mixer, at medium speed for 1 minute. Add brown sugar and cream for another minute, until mixture is lightened and fluffy. Add almond flour. Beat on medium until incorporated. Add all-purpose flour and salt and mix. Add egg and almond extract and run mixer on medium speed until all ingredients are incorporated and mixture is creamy. Mix butter, sugar and flour with your hands, or with a fork. Mixture should be quite loose, not very wet. You don’t want it to have a lot of butter in the mixture. Pinch a small piece of crumble with your hands, if crumbs stick together, you’re good to go. If they are still falling apart, add maybe half a tablespoon of butter at a time, until you obtain a crumble that is holding itself together, but isn’t too wet. Place crumble in the fridge while you assemble the pie. Sprinkle some flour on the counter. Remove dough from the fridge. Roll dough out on the floured counter. Now, mind you, the tart dough is very crumbly and you might have a hard time keeping it from breaking. It’s supposed to be this way, there’s no elasticity to it, because it’s supposed to be a cookie-like crust. Once you’ve sort of rolled your dough out to a 10 inch circle, transfer it to your tart pan. Remember, it’s totally ok if it breaks all over the place. That’s the beauty of this dough, you can simply press the dough down slightly with your fingers and patch pieces together. Once you’ve pressed the dough down the whole bottom and sides of the tart pan, trim off excess with a pairing knife, running it over the top, so there is no dough hanging. Place tart pan in the freezer while you prepare the rest. Now would be a good time to make the filling, while your tart crust chills. Remove skin from apricots and slice them thinly. Set aside. With a small pairing knife, cut long rhubarb ribbons lengthwise. The ribbons should be thin, long and flat. Set aside. I like to organize mine per color, so I can have a nice ombre effect when placing rhubarb ribbons on top of pie. Now you can start to assemble the pie. Remove tart crust from the freezer. Place apricots on the bottom of the crust. Spread filling evenly over apricots with the help of a spatula. Try to get the filling as even and smooth as you possibly can. Lay rhubarb ribbons on top of filling, trimming excess off, so there’s no rhubarb hanging off. Place small amounts of the Crumble Topping around the edges of the pie. 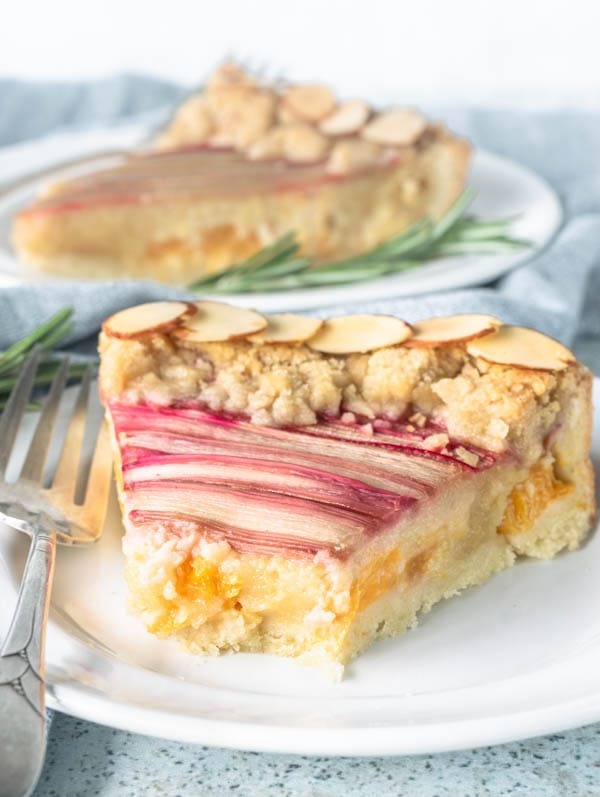 On top of the crumble, arrange slices of almonds like you see in the pics above. Carefully, stick assembled pie in the freezer for 15 minutes. Start to pre-heat the oven to 350F. Bake pie for 25-35 minutes. If the top is browning too fast, you want to cover it with foil so the bottom has a chance to bake. I like to bake my pie on the bottom rack of the oven so the bottom bakes, because the top tends to bake faster. Remove from the oven. Let it cool all the way, place in refrigerator for 2 hours until chilled. Pie will keep well for about 4-5 days, covered in the refrigerator. When you open I will be there if you’ll have tarts like this one! I am swooning over this combo. Rhubarb is my fave! Such beautiful clicks and the tart looks absolutely scrumptious! how I wish I could grab a bite from my screen! 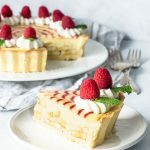 This tart is so beautiful that it should have a spotlight on it! It would definitely be the star of your bakery! Oh my goodness this look absolutely amazing! It truly looks delicious! I can’t WAIT to try this! Now, this recipe will be one of my favorites. Looks incredible! 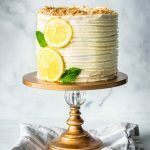 Love the unique flavors in this recipe! YUM! Wow! What a beautiful looking tart! 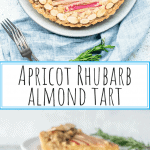 Love apricots and rhubarb in baking, they are so flavorful! It was a heavenly combo!! Thank you! you are really gifted on presentation. Every time I visit I am in awe on how lovely your desserts and photos are . This really looks and sounds fantastic, great job. I want a big slice! This tart is so beautiful! I love how rhubarb looks when it’s sliced like that. I bet it’s delicious too! This looks so incredibly pretty and sounds delicious as well. I don’t think I have seen apricot and rhubarb together but I can imagine they work well. Yum! It was delicious beyond words. Thank you! Such an impressive tart, so pretty. It looks delicious too!